Recently I came across a post from one of my favorite garden photographers, David Perry. 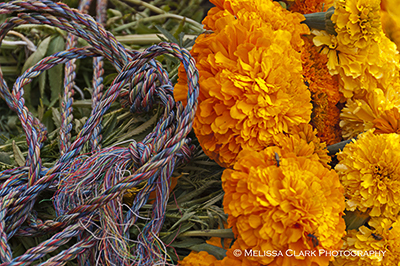 Entitled “Flowers Aren’t Just for Sissies,” it immediately brought to mind the scenes I witnessed during my trip to Mexico earlier this month during the Day of the Dead celebration. Perry’s message, aimed at “tough guy” types, includes the point that it’s OK to put cut flowers in something other than a delicate crystal vase. 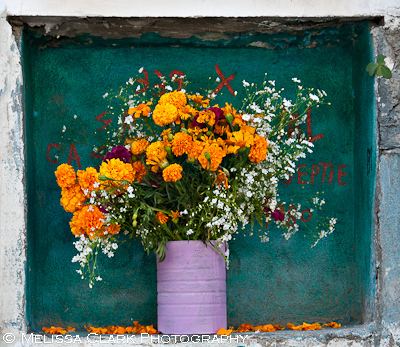 Like, for example, these lovingly arranged flowers in metal cans – or other humble containers – that I saw repeatedly in the old cemetery in San Miguel de Allende on the Day of the Dead while we were there. 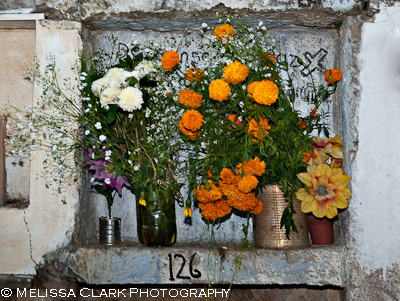 Another painted metal can with marigolds and coxcomb flowers is the central offering in this cemetery memorial niche. 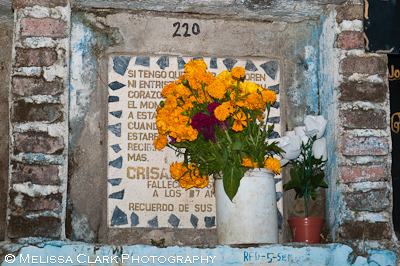 The cemetery was filled with families, including plenty of men, who were celebrating the lives of their beloved but departed family members by freshening graves (including piling newly dug soil on top of tombstones) and painting memorial niches. 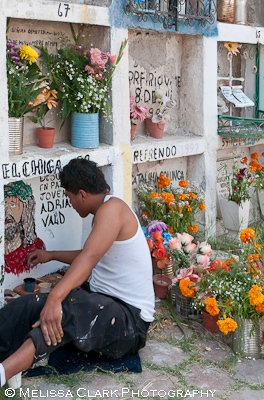 A family member repaints the back of a memorial niche before placing flowers as an offering on the Day of the Dead. Were there more elaborate memorials with formally arranged flowers? Absolutely. 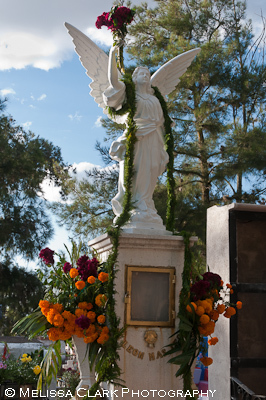 An angel stands guard over a tomb on the Day of the Dead, splendidly bedecked in garlands and with beautifully filled urns at her feet. What stays with me the most clearly, however, are the more humble offerings – and their simple, unassuming containers – that I saw at most of the graves or memorials. Flower offerings, whether for yourself, a friend, or the table, don’t have to be elaborately displayed. After all, it’s the flowers that are taking center stage and which you choose for your message. 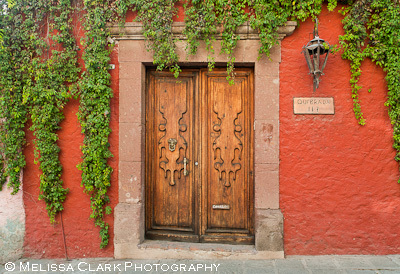 This is my new screensaver since returning home from my photo workshop in Mexico earlier this week. 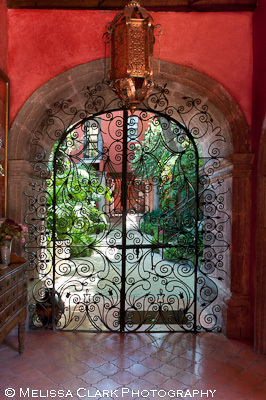 After three days in Guanajuato, we were taken in a van to San Miguel de Allende, lovingly described in its pre-American-expat discovery days by Tony Cohan in On Mexican Time. 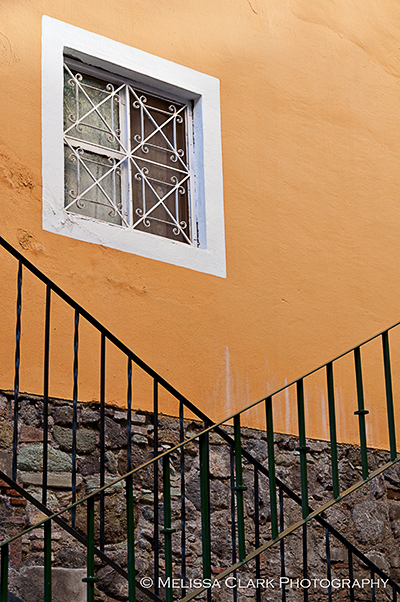 The streets of San Miguel are narrow and hard on your feet because they are paved in cobblestones. 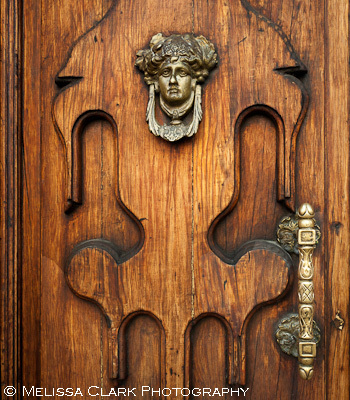 But as soon as we entered the doors of Casa Luna Quebrada, I forgot my aching feet and just stood with my mouth hanging open. You don’t have to be a gardener or photographer to love this hotel (or technically, bed and breakfast inn), but it doesn’t hurt. 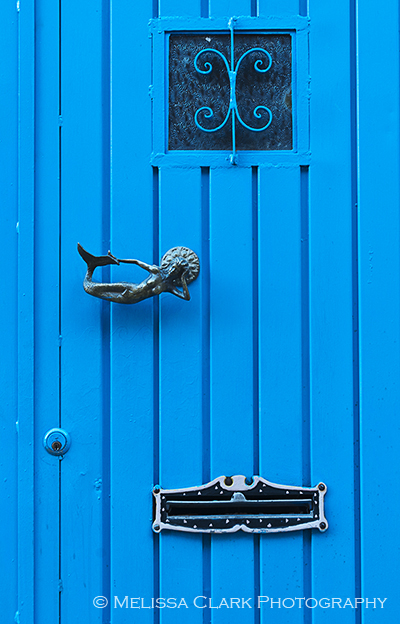 From the street, all you can see is a beautiful door in a reddish wall (complete with a fantastic polished knocker and handle). Greenery drapes down from above. 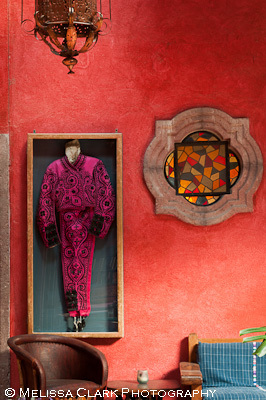 or the hallways, adorned with framed local costumes and lit by fantastic metalwork lanterns. 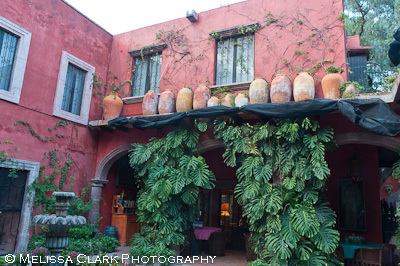 The rooms are lovely (and reasonably priced), the breakfasts delicious (our workshop leader kept saying he wanted to take the cook home with him, and we all shared his admiration of her talents), and the afternoon margaritas and guacamole outstanding. 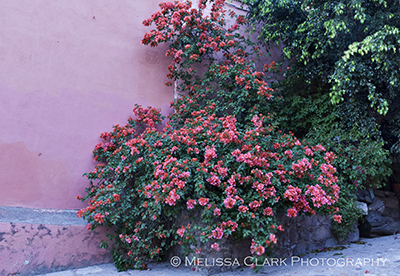 San Miguel, in central Mexico, is a safe, lovely and picturesque town to which I would return in a heartbeat. So many more photographs to take! (And I haven’t begun to share the best with you). Whenever I can manage to return, I will. 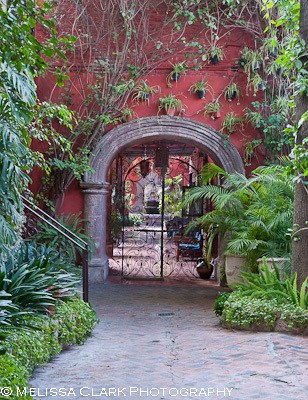 And I know where I’ll stay – Casa Luna. 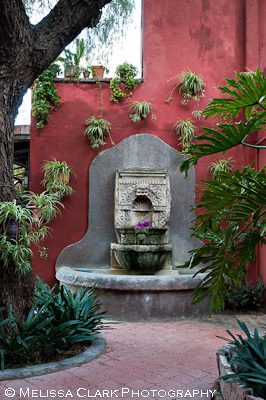 For information on Casa Luna’s facilities and rates and its sister establishment, Rancho Casa Luna, visit their website. 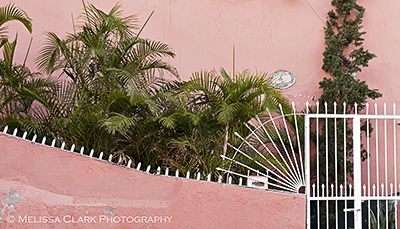 No words, no time, to describe the first stop on my photo workshop in Mexico. Just some photos. Enjoy.